As a hard working, honest high quality driving instructor, I get upset when I see a few rotten apple ADI's giving less value for a provisional licence holder's money by using various time wasting techniques to reduce the amount of actual driving time the learner gets. While some of these methods are blatant and I wonder why learners put up with them, others are very subtle. The most common way these instructors time waste is by giving very long driving lesson briefings, and a lot of the times it might not be for just introducing new subjects or topics. How can anyone teaching a practical skill like driving justify a 15-20 minute lecture on how to do the left reverse round a corner exercise? I was once told by a foriegn licence holder that 45 minutes of a 2hr lesson was spent by an instructor inducting him on how to drive in the UK all via talking while the car remained stationary! A learner driver does not need a 5-10 minute explaination following making a mistake at the junction. If the error was serious enough to require stopping, you can still draw a diagram, give corrective advice within a minute or 2. Using the toilets at a driving test centre. Every time I don't go in the car with a learner on the driving test, I usually encounter an instructor who comes into the centre use the toilets, and then has a 5 minute or so chat with one of the other ADIs, while the student sits in the car! Nothing wrong with going to the toilet if caught short during a lesson, but then going on to use a learner's time to have a social with a 'mate' is very un-professional! You as a learner should not tolerate this (there is a particular local instructor who I've seen regularly in one of the test centres I use, each time he spends more than 7 minutes after going to the toilet chatting), maybe they get away with it because they only charge £20 per hour, which is cheaper than other local schools. Other time wasting tactics include practising manuevers for a long time, getting stuck in traffic, going to the shops/bank, etc. As a driving instructor, I can't tell other ADIs how to operate their business, but you as a learner driver can have a say on what type of service you pay for. Many instructors get away with offering sub-standard services because the customer is willing to pay for it. The fear of changing instructors keeps a lot of learners with the same person hoping to pass the driving test and then not recommend them to a friend, but that is exactly the reason why they are still in business! Is your driving instructor using any of these time wasting techniques on your lessons? Will you continue to give them your hard earnt money? 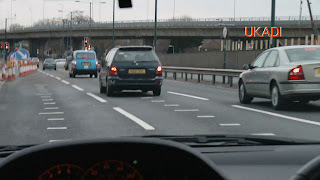 Subscribe to my driving test tips if you are learning to drive so you don't miss any future articles and get DSA updates direct to your inbox by Email. The service is provided and powered by Google Feedburner, so I don't personally keep your email addresses, and you can remove yourself anytime after passing the driving test with just one mouse click, you can also follow UKADI on twitter, and I have the UKADI Podcast to download driving videos from.